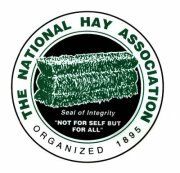 The National Hay Association proudly sponsors the World Forage Analysis Superbowl. Located in the arena building during the World Dairy Expo, October 3-6, 2019, the World Forage Analysis Superbowl Contest invites forage producers to enter their highest quality forages in eight different categories. More than $26,000 in cash prizes will be awarded to the top samples that are then displayed at WDE. Click here to download the entry form and rules. Have you been thinking about Joining the NHA? If you join the NHA now, you will receive 2 years for the Price of 1! That's right, sign up today and your membership will run through June 2020! Need our W-9? Click here.